How Much is Enough? The Department of Energy recommends an R-49 or higher as the minimum insulation R-Value for maximum energy efficiency in Michigan. We use Applegate Cellulose Insulation because it provides a superior value. This "green" insulation is environmentally friendly, is made of 80-85% recycled newsprint, and it provides an R-Value of 3.8 per inch. 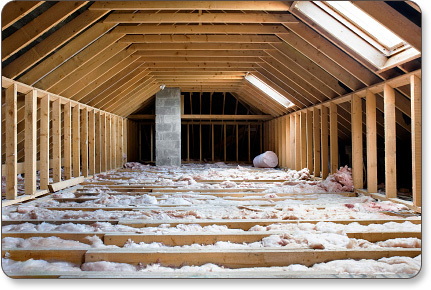 Many companies advertise that they will add "inches of insulation" to homeowners' attics to achieve energy efficiency, which is very misleading. We actually calculate the amount of insulation necessary to achieve maximum energy efficiency based on your home's square footage, the amount of insulation currently in your attic, and the desired R-Value. As such, this calculation is individualized for every home. We densely pack our insulation in both new and existing homes, which provides a monolithic (unified, no voids or gaps) block. Dense packing takes the guess work out of the installation process, as every space that can hold insulation has insulation, ensuring that every inch is utilized to provide the maximum R-Value. Additionally, dense packing results in enough insulation being installed at a sufficient density level to significantly reduce air movement/infiltration, as compared to other products. Our products are stable and will not settle, as opposed to other products, which ultimately settle and compress due to gravity over time, leaving you with less insulation than you paid for. Our trained specialists will determine how much insulation you need to maximize your home's energy efficiency. We will determine if your home has air leaks by using several different testing measures. If we find air leaks, we will repair holes at plumbing penetrations, caulk windows, and weather strip doors, as necessary. Leaking ducts can reduce your air conditioning unit's efficiency by up to 30%. 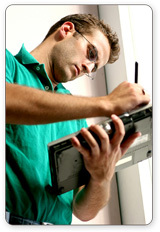 We will test your system and make the appropriate repairs. This work may be covered wholly or in part by the Texas Energy Incentives programs. Call our office today to see if you qualify. Good ventilation is essential for reducing heating and cooling costs. Ventilation is a necessary component of maximizing the efficiency of your insulation and for maintaining a healthy house. We offer a wide range of ventilation products, including ridge vents, soffit vents, turbine vents, solar-powered vents, and static vents. Our trained representative can give you a free, no obligation general assessment of your home's energy efficiency. 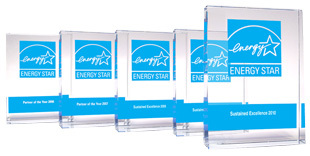 If you are looking for a more in-depth energy audit for your home, at an additional cost, our certified Home Energy Rater can give you a very detailed assessment of your home's energy efficiency. Our HERS rater will identify specific energy issues and provide you with suggestions to maximize your home's energy efficiency.